Having gorgeous hardwood floors in your home is much easier than you think. We have an exceptional selection at great prices. Whether you’re planning to redecorate your entire home or just want to freshen up part of it, we have you covered. Our showroom and online catalog are full of outstanding hardwood flooring to choose from. Whatever your style is, you’re sure to find a perfect set with us. Our goal is to provide you with a floor that will perfectly fit your needs in looks, performance, and price. When deciding on what type you want, rely on our knowledgeable specialists to answer any questions. They are available for recommendations on the best brands for hand-scraped hardwood or anything else in our catalog. Let us match the perfect color and species for your home today, and then provide effective and efficient hardwood flooring installation. Brand new floors make an instant impression on guests and family. From deep maple to vibrant red oak, the natural look of wood fits every style. If you’re looking for a reliable and sturdy choice that doesn’t compromise on looks, check out our selection of engineered hardwood. These planks are made by combining multiple layers of wood to add even more strength to the product. Accidental drops and scrapes don’t stand a chance at damaging these floors. We often recommend engineered planks for families with small children or pets. Because these floors are made of many pieces of wood, they withstand temperature and moisture changes. This makes them perfect for any room, including basements and kitchens. You never have to worry when you select engineered planks because they’re built to last decades. Once our professional installers complete your new floor, all it needs is occasional cleaning. Simplify your life and choose hardwood floors for your next home improvement project. There’s a reason why solid hardwood is still a popular option after so many decades. The panels look gorgeous and feel great underfoot. As the name suggests, each piece is a single piece of wood. This lets you choose from a wide variety of species, colors, and grain patterns. We offer both strip and plank flooring in different widths, anywhere from one inch to eight. This lets you get the exact pattern and style you want. Wider planks give your rooms a rustic appeal while narrower once add liveliness to the area. 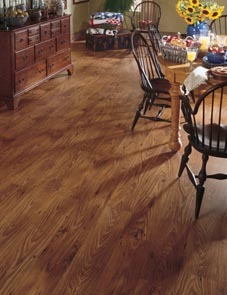 Once our trained team installs it, this flooring keeps its beauty for years to come. Because each plank or strip is one piece of wood, refinishing and refreshing the planks is simple and easy. The wood allows you to strip, sand, and buff the floor multiple times over its lifespan before it needs replacement. So when you want to update the look of your hardwood, just resurface and stain it. This grants you the flexibility you’re sure to appreciate over the years. To give your home a lived-in look instantly, choose hand-scraped hardwood from our extensive catalog. Each plank features unique patterns and grooves for a truly one-of-a-kind floor. Many of our options have an antique feel to them because of how the manufacturers scrape and distress the boards. Many of our clients select this when they want to craft a warm and inviting space in their home. Best of all, the scraping process doesn’t make the wood any less reliable or sturdy. You get the same confidence you come to expect from hardwood floors. Once you select the perfect pick for your home, depend on our hardwood flooring installation to get the most out of your new planks. We cover every detail of the process from start to finish. There’s never a reason to call a contractor or other store because our team is ready for any sized project. We start by accurately measuring the area in order to most efficiently use the material. If for some reason you don’t absolutely love your hardwood, we will correct any issues at our expense. Contact us for experienced help in selecting the perfect hardwood flooring for you. We proudly serve the communities of El Cajon, La Mesa, Santee, Alpine, and San Diego, California, as well as the surrounding areas.